Bartenders everywhere are increasingly using a more natural option to sweeten their cocktails – honey. Honey takes the edge off some spirits and has a depth of flavour that sugar syrups can’t match and is now being used to create new cocktails and twists on the classics. Honey cocktails have proved so popular with drinkers at New York’s Waldorf Astoria hotel, that the beverage manager installed beehives on the rooftop of its 20th floor in order to have his own natural and unadulterated supply! We think this is a great idea, not just for the bars that care about their ingredients and want to stand out from the competition, but also to boost urban biodiversity in our cities. 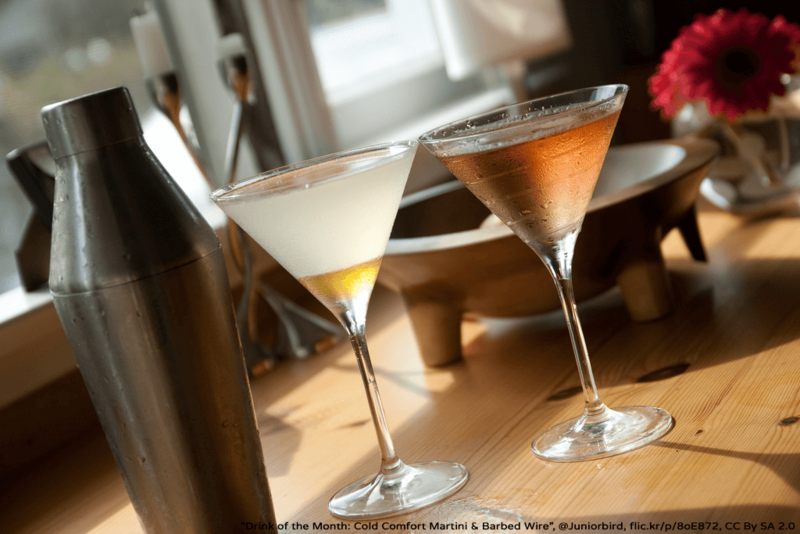 How about trying a honey based cocktail which is both delicious and a doddle to make – a Gold Rush. Make a simple honey syrup by mixing 15mls (a teaspoon) of warm runny blossom or heather honey, with a dash of warm water then add 50mls of bourbon and 25mls of freshly squeezed lemon juice. Shake in a cocktail shaker then pour over ice and sip slowly. We previously treated our guests at the Christmas table by adding some honey to seasonal staples such as turkey and ham. After a well-deserved break, those lucky enough to have enjoyed the mains are in for some more treats – honey inspired Christmas cake and biscuits. Christmas Cake with a Difference Christmas cake is a rich, sticky, treacly treat but it can become a little stilted served the same way year after year. In addition to the usual peel, nuts, spices, dried fruits and brandy, add some chopped dried figs and two tablespoons of runny blossom or heather honey to the cake mix for even more decadence. Alternatively, replace the figs with some saffron to add a little colour and spice that perfectly complements the floral notes of the honey. You didn’t think you wanted any more, but the warm and festive smells of ginger, honey, cinnamon and vanilla are filling the room as a plate of Christmas cookies are brought from the kitchen. 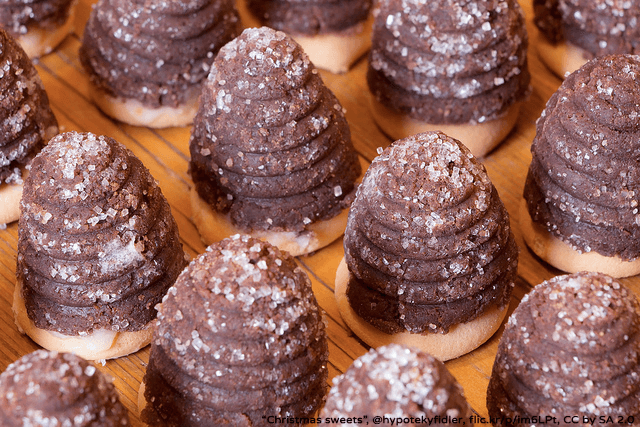 Germans celebrate the season with a number of different cookies and biscuits made with honey, including Honig Lebkuchen – Honey Gingerbread or the crispier Leckerle which both date back to the middle ages when honey was the common sweetener. Still got a sweet tooth? How about some heavenly heather honey fudge served as a petits fours with some freshly brewed coffee to revive drowsy diners. A popular ‘medicinal’ drink in Scotland in the wintertime is the ‘Hot Toddy’. Mix two tablespoons of runny blossom or heather honey with Scotch whisky, a tablespoon of lemon juice, cloves, cinnamon and a small piece of ginger and stir with boiling water – it’s for treating the common cold, honest! We’re looking back at what has been an incredible and defining year for Plan Bee Ltd. From January’s appearance at the Scottish Supplier Show which took us to September’s Ryder Cup, to starting our ground-breaking investment campaign in April then working tirelessly until we made history with it in July. We have compiled a video of some of these special moments. We’d like to give our thanks and appreciation to enthusiasm, positivity, effort, time and ability of all those who helped us in 2014 and our gratitude to all our customers, clients and investors – whom without their belief and vision to be part of the movement, we could not achieve what we have. 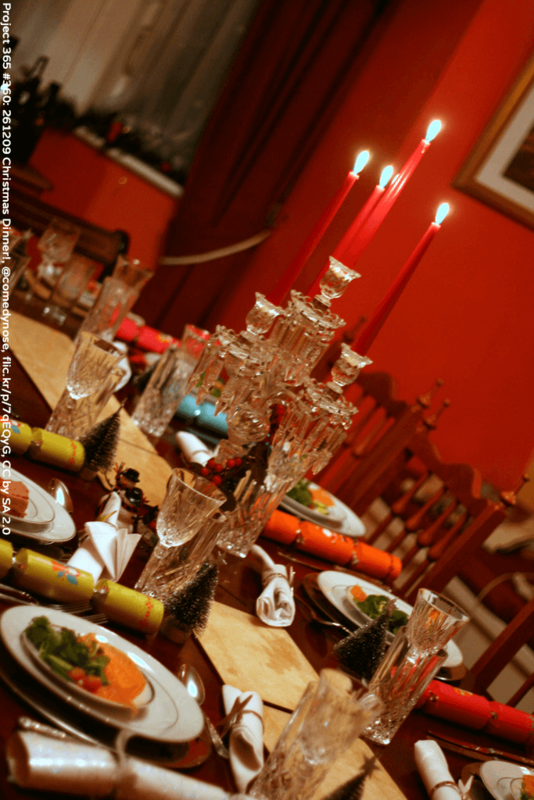 It’s the season for spending time with loved ones, giving and goodwill to all men, but Christmas is also a time when we seem to indulge in rich and decadent food and drink just that little bit more than usual – to eat, drink and be merry. There are a few seasonal menu staples that benefit from honey as an ingredient, so let’s have a look at what you could serve up for Christmas dinner that benefit from a drop of the nourishing, sweet stuff. You can’t get more traditional than a turkey but why not give it a twist by coating it in honey before roasting. Melt two tablespoons of runny heather or blossom honey into 50g of butter in a pan before pouring hot over the turkey. As the mixture cools it will stick to the skin, then put in the fridge uncovered to marinate for 24 hours. Roast as you would according to weight and baste the bird frequently. The honey coating will gradually turn the skin dark brown and leave the meat beautifully white underneath – looking dramatic and tasting delicious. More well known, is a honey glazed Christmas ham, which can be served hot on the day or prepared in advance and enjoyed cold. Cook the gammon joint in your chosen stock and make the glaze by adding 125g of runny blossom or heather honey to 100g of demerara sugar, 25mls of sherry vinegar and 50mls of Madeira wine in a pan before simmering until it darkens and becomes thicker. Pour the hot, syrupy glaze over the ham and roast according to weight and basting frequently with the mixture. You might eat hot at the Christmas table but you will be coming back for the cold leftovers on Boxing Day! 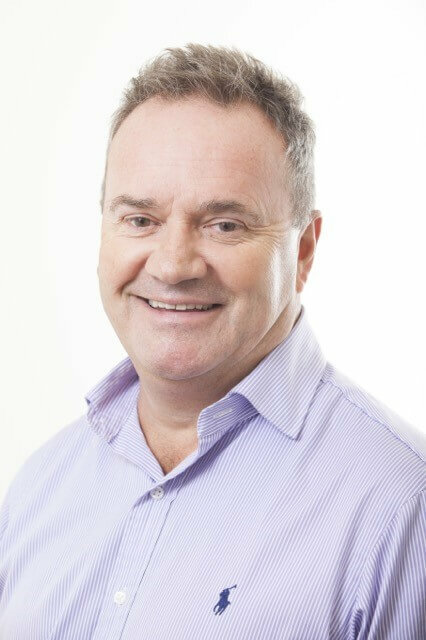 Plan Bee Ltd are proud to announce that Mr Michael Lees (pictured) will be taking over as the company chairman, replacing Mr Jim Hall of Kelvin Capital who is standing down. Mr Lees has an illustrious background in brewery management, rising from operational roles with Bass Brewers to become Managing Director of Tennent Caledonian Breweries UK. During his tenure, Mr Lees oversaw ten years of continual growth for the company to lead brand share in the market. Plan Bee Ltd believes that Mr Lees vast experience of successfully running large operations will move the business forward, helping to open international markets and provide unrivalled expertise in the development and marketing of the companies honey based craft beer and meads. 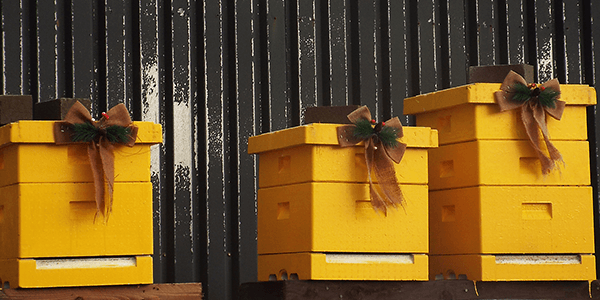 “Without Jim’s enthusiasm and commitment to Plan Bee Ltd, we would not be where we are today, he was instrumental in achieving the first SEIS funding round”. Jim Hall will continue his work with Plan Bee Ltd as Investment Director of the brand. Last Black Friday was more like a Black & Blue Friday with some poor bargain hunters still having the bruises to prove it! But there will be no such hectic and crazy scenes here at the Plan Bee Ltd Hive-Q when we offer our version – Black and Yellow Friday on December the 12th. There will be no jostling, pushing or downright rudeness as you click onto www.planbeeltd.com/shop and simply enter the code blackandyellow to receive a 15% discount* off anything and everything at our online store. 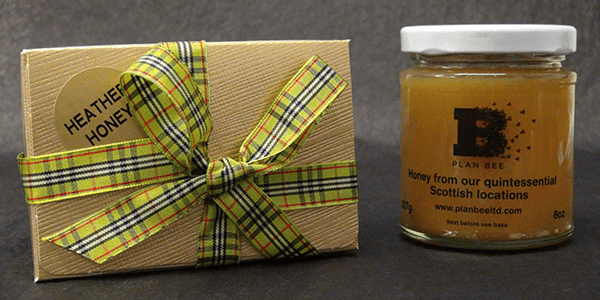 The offer is for one day only, so make sure you take advantage and fill your hives with our award winning natural Scottish honeys, fudge and candles whilst making a good saving on our hampers and gift boxes for friends and family just in time for Christmas. No unseasonable squabbling to get a bargain here, just goodwill to all mankind! *Offer starts on the 12th of December 2014 at 00.01am GMT and ends at 11.59pm GMT. Discount doesn’t apply on delivery prices. Our recent participation for the St Andrews Day festival at London’s Borough Market was a great experience on a number of levels. 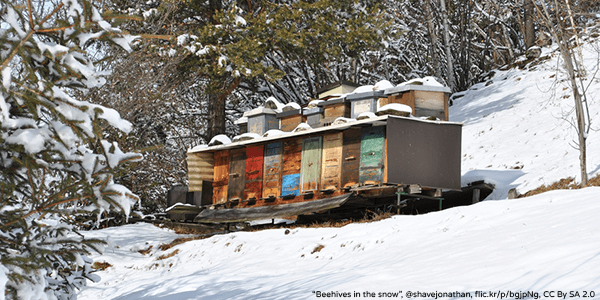 Not only did we engage with many people from different parts of the world who were interested in our products and the environmental importance of bees, we saw the same involvement between customers and small, local producers happening right across the market. A visit to a market like this isn’t just about filling a shopping bag; it’s becomes an experience as customer’s interact with producers – trying samples they have displayed and asking questions about their provenance and process. But it’s not just a one way exchange – the producer is getting first hand market research into what customers want (and perhaps what they don’t) – valuable in honing and perfecting their product or how they sell it. It’s also of key importance to local producers who aren’t yet visible in high street delis or discerning stores that customers buy and spread the word about their products. It was heartening to see many of our fellow Scottish producers at the Pride of Scotland Food & Drink Weekend at Borough Market, get the same positive response and involvement from their customers. This is vital to local producers for their continued commitment to producing a great quality product and maintaining ethically sound principles while doing so. 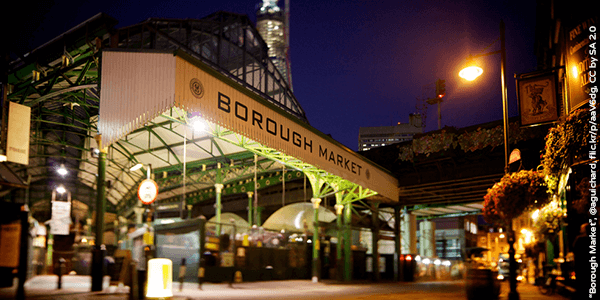 So, our thanks and appreciation goes to Think Local and SAC Food & Drink Consulting in making the Borough Market trip possible and to all the customers at markets past and future supporting local producers. A slow burning, flickering candle filling the house with scent provides an atmospheric comfort on a cold winters night. But candles don’t just make a relaxing Christmas gift, they are linked with the festive season and religious celebration in a number of ways. 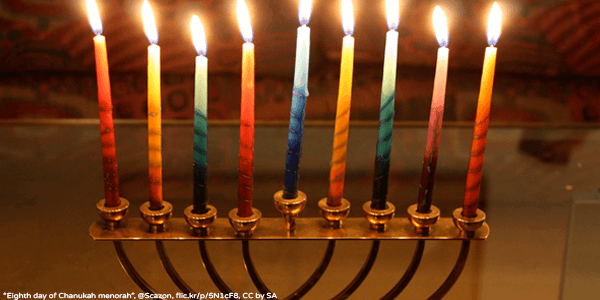 For eight days in December, one candle is lit each day and placed on a distinctive nine stemmed candelabra to celebrate Hanukkah – the Jewish Festival of Light, which has been observed for over 2500 years to mark a miraculous event in Jewish history. 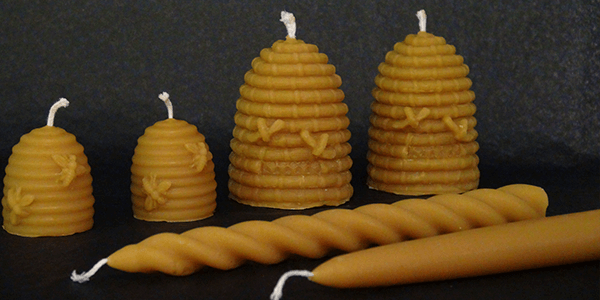 Plan Bee’s candles made with only pure beeswax and cotton are considered kosher and can be used for this purpose. But their connection with this time of year goes even further back, when used by pagans during the ancient winter solstice to remember that spring would soon come. Candles would come to specifically symbolise Christmas during the middle ages and later to actually decorate the Christmas tree before safer electric lights! Today, carols by candlelight services are still a popular and atmospheric way to mark the connection between candlelight and Christmas. 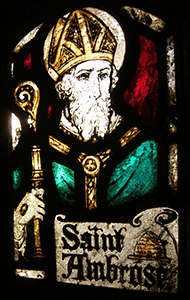 The Advent of the feast of St. Ambrose occurs today. St. Ambrose is of particular significance to Plan Bee as he is the patron saint of bees, beekeepers and even candle makers! In his iconography, he is often depicted with bees or a beehive – symbols that also indicate wisdom. He would lend his name to the Latin term for honey ‘ambrosia’ also used in Greek and Roman mythology to describe the food of the gods. St Ambrose is still referenced today by modern beekeepers, using the term ambrosia to describe the mixture of nectar and pollen prepared by worker bees to feed bee larvae. If you haven’t already had a peek, our new online shop has opened, where you will find our award winning Scottish honey, fantastic fudge and our range of pure beeswax candles. 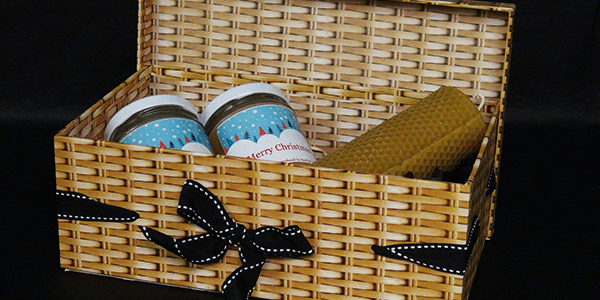 And as it’s coming up to Christmas, the elves at Plan Bee have been hand-packing these natural and sustainable products into an attractive selection of gift boxes and hampers, complete with wrapping and dainty wee tartan bows, so you don’t have to tie yourself in knots to make things look pretty! It may also be that you need some honey to glaze the Christmas ham or want to harness the health giving and restorative qualities of honey to add to lemon (and possibly a wee dram) as a seasonal cure for the cold. Our candles also make an atmospheric and sweet smelling addition to the home or dinner table during the festive season and come small enough for a stocking filler. As an introductory offer, we would like to give customers a 10% discount of all orders up until the 17th of December, so they can make some bee-savvy savings on treats for yourself or on thoughtful, eco-aware gifts for family and friends. Simply go to and www.planbeeltd.com/shop type in the discount code ‘environment’ to fill up your hives (not your trolleys!) and we will be sending our naturally good products out to you soon.